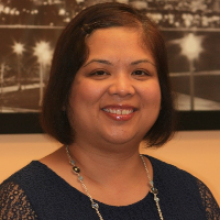 Dr. Luat was born in the Philippines, but migrated to the US with her parents when she was six months old. She grew up in Chicago, where she received her Bachelor’s Degree from DePaul University and then went on to pursue her Dental Degree at Marquette University School of Dentistry. After practicing back in Chicago for 13 years, the winters became less tolerable so her and her husband decided to move to Arizona and has been enjoying the sun and warmth ever since. In her free time, Dr. Luat enjoys playing the piano and singing (particularly with her church worship team), trying new restaurants and watching sports of all kinds. She is married to Neil and they have two kids, Megan and Joshua. For more information please visit www.adgsmiles.com. I recently went to Dr. Luat’s office for the first time and for my first filling ever, which I was absolutely petrified about. Everyone there is awesome. Having fillings done sounded terrifying, I am not a fan of the dentist already, but having needles in my mouth? No thanks. I’ve been putting off the work forever, but finally decided to go to Dr. Luat. She was very thorough and made sure I understood everything. She checked on me throughout the procedure to make sure I was doing OK. I was worried that this quality of service would cost me an arm and a leg, but when I saw the dental plan they offer with the prices I was very impressed. I was going to have another dentist put in silver fillings, but this place was charging me way less than that place. I’ll never go to another dentist in Glendale again. I haven’t been going to this dentist office for very long, but I already love it. It is a brand new development and is very close to a couple of stores. There is plenty of parking. The brand-new office is truly beautiful, with natural lighting, modern designs, TVs and Ipads for patient entertainment, and wood flooring. The front office staff is professional and easy to talk to. It is a family-oriented place. Going back to the exam rooms I was happy to see the best dental technology out there, the best dental chairs, and TVs with cable access to any channel a patient could want. They really take care of you. Dr. Luat went to school at one of the best dental schools, and her work proves that. It was very high quality and done fast. She’s so much better at her job than other dentists in Glendale, AZ. She doesn’t try to force you into paying for things you don’t need, but she gives her honest expert opinion. Your teeth will look great when you walk out of her office. I can’t recommend him enough. My family had been trying to find a new dentist in Glendale for a couple years now, and then a family friend recommended this place to us. My husband had a dental emergency a couple months ago and they were able to see her that same day. Now our whole family goes here. The doctor is very nice and makes you feel comfortable. Her whole staff is great, anyone looking for a new dentist should go here. Unlike dental insurance, a direct dental plan with Dr. Luat and Doctors Network is a membership that gives you access to significant discounts on almost all of our services. Everyone can join for a low monthly fee of $29.99 and a one-time activation fee of the equal amount. The cost of membership is typically a fraction of most dental insurance premiums. Patients who sign up for a direct dental plan through our office in Glendale can attend routine preventive exams and cleanings for only $25 per visit. This includes X-rays, when necessary, and the cost does not change no matter how many times you visit per year. When cosmetic or restorative treatment is required, the costs of your treatment will be discounted by up to 90%, including fillings, dental crowns, dental implants, Invisalign® and more. Dr. Luat, our team, and the experts at Doctors Network share the common goal of making dental care simpler, more affordable, and more attainable for all of our patients. Please note that a direct dental plan is not insurance, and is not designed to replace your existing coverage. We offer this direct dental plan to help reduce your out-of-pocket expenses and therefore maintain your oral health. If you have questions about Doctors Network, or are ready to sign up, then contact Dr. Luat at Aesthetic Dentistry of Glendale today, or call Doctors Network at 1-866-800-3168. General dental care is as important to your smile as taking care of your teeth at home. For instance, checkups and cleanings are necessary to evade oral health issues like tooth decay and periodontitis. At our Glendale, AZ dental office, Dr. Luat and our team offer an array of general dental procedures to help you enjoy a lifetime of beautiful smiles. When it comes to your oral health, prevention is vital. Therefore, the main focus of exceptional dental care is preventing dental diseases from developing in the first place. Besides practicing good hygiene, professional dental cleanings and check-ups help stop the development of bacteria-rich plaque. Other treatments, such as scaling and root planing (deep cleaning), bone and gum grafts, dental extractions, and more, can also help you address existing issues before they grow worse. At your general dentistry appointment, your dentist will carefully perform a comprehensive dental exam for signs of trouble. Then he or she will recommend an appropriate course of treatment to stop the problem from worsening. However, successfully protecting your smile from further trouble will still rely on ongoing general dental care. Schedule a Visit with Your Glendale General Dentist Today! With a strong focus on prevention, general dentistry is essential to keeping your smile healthy and beautiful. To schedule your next visit, call Dr. Luat's dental office in Glendale, AZ today at (623) 937-9241.